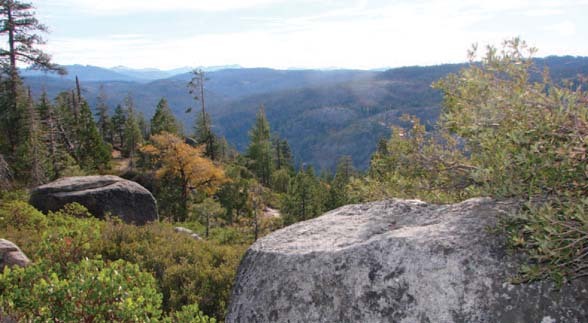 Liberty Vista’s breathtaking turnout is the first west-to-east viewpoint of the glaciated canyon of the North Fork Stanislaus River 1,500 feet below the vista, as well as surrounding granite outcroppings, mixed conifer forest, the Carson-Iceberg Wilderness area, and the distant mountains surrounding Sonora Pass. Liberty Hill (7,619 feet), for which this vista is named, is a volcanic ridge that can be seen directly across the canyon. Here you stand on some very interesting geologic features including granodiorite (a form of granite) that began as an upwelling igneous intrusion 80-90 million years ago, miles under the earth’s surface. During the millions of years it took this igneous rock to cool, erosion was stripping away most of the overlying rock, exposing and eroding the granodiorite. But then extensive volcanic activity erupted, and again the granodiorite found itself covered by volcanics thousands of feet thick. By about three million years ago basaltic flows, andesite, mudflows, tuff, ash, and other volcanic material covered the entire area. However, with the Ice Age (one million years ago), more erosion through uplift and glaciation carried away the much of the volcanic cover, leaving behind the remnant volcanic ridges and outcroppings that can be seen today. There is ample parking at the turnout for Liberty Vista, and the landscape creates a great photo opportunity. There are no established trails from this point, but the view is well worth the stop.